What are stormtroopers? How many types are there? Who do they work for? Perfect for children who are new to Star Wars and also for young fans of the movies, this exciting guide will answer these questions and many more and teach children fun facts about stormtroopers - including following Finn's incredible journey from First Order stormtrooper to Resistance hero!Learn more about stormtroopers' most famous battles and missions, such as on planet Hoth and Endor's forest moon. Discover what weapons stormtroopers use, the training they undergo, and whether they always obey commands. 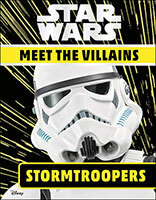 Featuring a simple Q&A format and exciting images, DK's Star Wars Meet the Villains- Stormtroopers is a fun, welcoming introduction to the Emperor's infamous forces as children learn about their lives in a galaxy far, far away. With colourful movie stills from the original trilogy, prequels and the latest sequels, DK's book lets children explore everything there is to know about stormtroopers! & TM 2019 LUCASFILM LTD.What are stormtroopers? How many types are there? Who do they work for? Perfect for children who are new to Star Wars and also for young fans of the movies, this exciting guide will answer these questions and many more and teach children fun facts about stormtroopers - including following Finn's incredible journey from First Order stormtrooper to Resistance hero!Learn more about stormtroopers' most famous battles and missions, such as on planet Hoth and Endor's forest moon. Discover what weapons stormtroopers use, the training they undergo, and whether they always obey commands. Featuring a simple Q&A format and exciting images, DK's Star Wars Meet the Villains- Stormtroopers is a fun, welcoming introduction to the Emperor's infamous forces as children learn about their lives in a galaxy far, far away. With colourful movie stills from the original trilogy, prequels and the latest sequels, DK's book lets children explore everything there is to know about stormtroopers! & TM 2019 LUCASFILM LTD.